The TM-T88IV Thermal Receipt Printer is the perfect solution for high-volume retail and hospitality environments that require fast and quiet receipt printing. The TM-T88IV provides reliability and ease of use with drop in paper loading, tear bar or auto-cutter and Auto Status Back messages. It can print text or graphics in two colors at nearly 8 per second and is available with multiple interfaces, including wireless options. 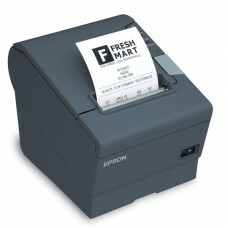 Epson TM-T88IV - Thermal, Ethe..
Epson TM-88IV ( Ethernet )The TM-T88IV Thermal Rec..
Epson TM-T20 - Thermal Receipt..
Epson's cost-effective ReadyPrint TM-T20 thermal p..
Epson TM-T70 - T70II, Ethernet..
Front-facing controls, paper loading and receipt d..
Epson TM-U220: TM-U220A - Impa..
Epson TM-U220 TM-U220A - Impact printingAll ..
Pegasus RP6000 SeriesPegasus RP6000 series,Intel® .. The Star TSP800II is a revolutionary wide-format P..